THIS is what happens when the people have finally had enough of a tyrannical government that has no use for the citizens it serves other than as a means to finance their power as elitist rulers. The liberal EU and Macron agenda of taxing the French people to death and opening France’s borders to criminal hordes of Muslim migrants from the Middle East and Africa has given birth to the Yellow Vest movement, now much more than a growing army of protesters. The “gilet jaunes” (yellow vests) movement began in response to Macron’s and the French Parliament’s intent to impose a fuel tax to pay for a green energy agenda. Keep in mind this high-profile grassroots movement began only two months ago and is now threatening to topple the French government. Named for the yellow vests that the protesters wear and identify with, which are required equipment in every motor vehicle in France, the movement was sparked by the increase in fuel taxes. It has now grown to a demand that Macron resign and Parliament be dissolved. So threatening to the French government is the Yellow Vest movement that Emmanuel Macron has gone into hiding much of the time recently and French police are routinely involved in hand to hand combat with protesters, who are often the victors. 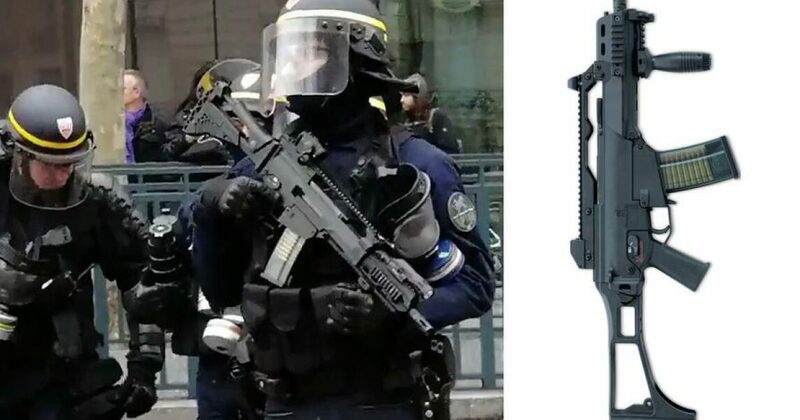 French riot police are, for the first time since the Yellow Vest movement began, carrying Heckler & Koch G36 assault rifles with 30-round magazines. French police carrying assault rifles is not an insignificant development and signals that Macron and the French government now intend to shoot protesters who have become inceasingly aggressive as the movement has grown. Watch the video below of French citizen, Christophe Dettinger, who also happens to be a former light heavyweight champion, assaulting a police officer who has only his baton and shield to defend himself. Dettinger claims he was reacting to police beating defenseless protesters while they were lying on the ground. Dettinger was arrested after turning himself in and is being held without bail until his February 13 trial. The Yellow Vests have raised a legal defense fund for the former boxing champion, which quickly raised $135,000 before being closed. THIS is what happens when politicians forget they are public servants, not masters.